You can diet 'till the cows come home but if you don't replace fat with muscle, you will gain back every ounce plus some for the effort. Muscle burns calories. Especially the large muscles in your thighs, calves and upper body. The best weight loss exercise programs build these muscles. This results in reduced age related weight gain. Muscles need calories. For every pound of skeletal muscle you burn an average 70 calories per day. Compared to the three calories a day required for the same amount of fat. Everyone needs anaerobic or resistance exercise. Many call it strength training. I’m not talking about developing a “hulk” like physic or strenuous weight lifting. But you do need to build muscle, then maintain it. 10 Best Exercises For Weight Loss :: What thousands of people say works for them. Maintaining muscle mass is the absolute best, all time, number one way to KEEP YOUR WEIGHT OFF FOR A LIFETIME. Diet alone won’t do it. All of the golden diets like Weight Watchers, NutriSystem and Jenny Craig recommend exercise (it’s in the small print on their television commercials). Even though perfect portions are delivered to your door, you still need muscle to keep lost weight off. Weight resistance training can be achieved from machines like Bowflex and other gym workout devices. You can also use your own body’s weight for weight resistance exercises. Strength exercises for losing weight are usually recommended in the form of at least two or three, 30 minute workouts per week. Muscle beats fat like a rented mule. I can’t overemphasize how important the development of a lean muscle mass is to your long term weight loss. Folks who pay the price and consistently keep a lean muscle tone, KEEP WEIGHT OFF. You lose muscle mass as you age. The older you get the less muscle your body has to burn calories. You burn less energy and store more fat. You must restore this muscle by exercising. If you don’t you have to constantly reduce calorie intake as you age. Which is no option at all. 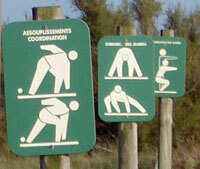 Smart weight loss exercise programs have both cardiovascular and strength building activities. You need both and you need to make a commitment to this kind of physical activity for the rest of your life. Consider this. The average American woman will gain one and a half pounds per year due to age, reduced metabolism efficiency, hormonal changes, reduced physical activity, muscle loss and bone deterioration. The result is a 30 to 50 pound increase in weight by the time you reach 50. There is no better way to combat aging than with a healthy diet plan and smart weight loss exercise programs. Losing weight is not a temporary activity. It must become a lifetime pursuit for you to reap all its rewards and not become a victim of age related, creeping corpulence. A great substitute for traditional strength and resistance training is old time calisthenics. Push-ups, leg lifts and pull-ups are all extremely effective for building muscle. Add some sit-ups and some crunches and belly fat can be reduced significantly. You can’t just read about the many exercises for losing weight. You have to perform them. Frequently and consistently. and leave More Best Weight Loss Exercise Programs.